Introduced to a funky little Twitter tool today called Tweet 3D. So entered my Twitter username and, well this video says it all really! Engadget reports on the growing increase in mobile phone ownership across the world. …the United Nations communications chief has boldly predicted that half of planet Earth’s population will be hooked on some sort of mobile phone before 2009 dawns. Though how many of those subscriptions will include unlimited data I suspect will be very small and I suspect an even smaller number of those phone users will be using them for learning. Learning in a digital age – are we prepared? Register now for the third international JISC online conference. This important conference for practitioners and managers embedding e-learning into their practice focuses on the tension between the tried and tested and the wholly innovative. e-Learning may now have established a foothold in learning and teaching, but are the demands of delivering the curriculum restricting its innovative potential? How can we plan to ensure the best possible e-enhancement of learning in the future? Keynote speakers are Professor Gilly Salmon, University of Leicester, on transforming curriculum design through technology and Professor Rose Luckin, London Knowledge Lab, on the relationship between learners, their tutors and institutions. The closing keynote is being delivered by John Davitt, writer, broadcaster and education technology specialist. The conference has two themes each running over two days and will also include guided tours in Second Life facilitated by the JISC Emerge team. During the reading weeks, the two weeks prior to the conference, there will be orientation sessions for delegates new to Second Life. We are pleased to have James Clay, mobile-learning enthusiast, as the conference blogger. Some sessions will make use of the Elluminate real-time web conferencing system. Finally, the e-Learning Showcase will provide a shop window on innovative work from JISC e-Learning projects and services and social events include a virtual fashion show. Details of the programme are available at www.jisc.ac.uk/elpconference08. One of the things about Twitter is the interconnections between different people on Twitter. 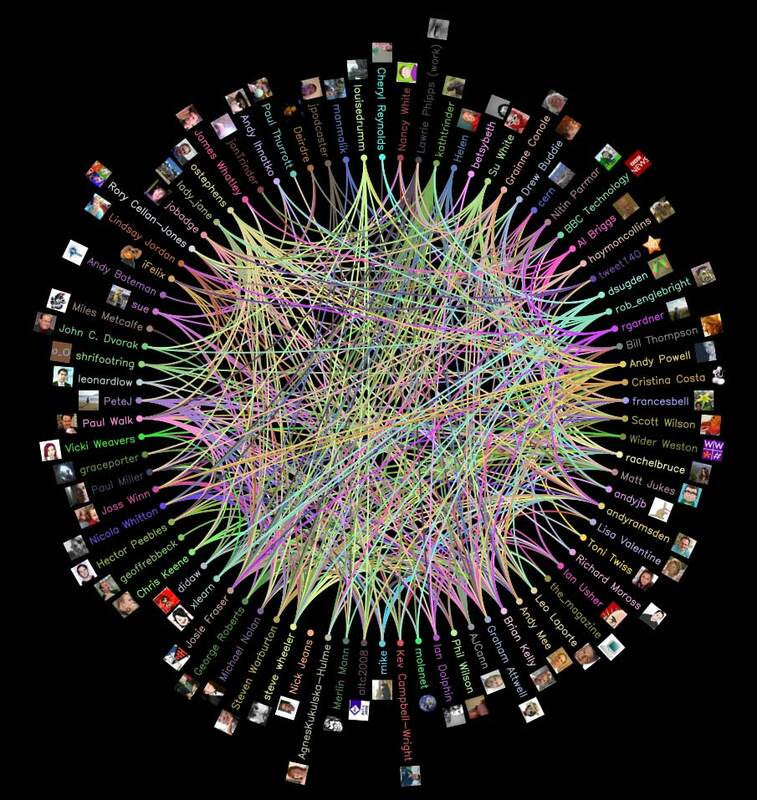 Tweetwheel allows you to show who follows who via a very nice graphical wheel. View my “proper” interactive Tweetwheel here. It was interesting for me to find out that though I follow a fair few people, they rarely follow the same people I follow. There is some interconnectivity, but not as much as I thought. Apple has announced an interesting development for US Universities, the iPhone Developer University Program. The iPhone Developer University Program is a free program designed for higher education institutions looking to introduce curriculum for developing iPhone or iPod touch applications. The University Program provides a wealth of development resources, sophisticated tools for testing and debugging, and the ability to share applications within the same development team. Institutions can also submit applications for distribution in the App Store. Alas this is not a program(me) to develop learning applications for the iPhone, but merely a programme to teach students how to develop applications. You are currently browsing the e-Learning Stuff blog archives for September, 2008.